Worship of democracy is widespread idolatry – the will of the people vs. the God of the Bible. Real Christians don’t vote. Despite the noise from corrupted, pushy, Western Christianity, genuine faith is opposed to the power systems of the unbelieving world. Nothing is new under the sun. Since the Fall mankind has been at enmity with the Creator. 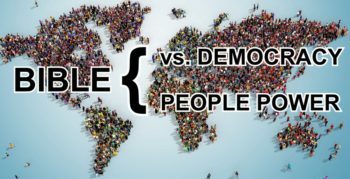 In this post I claim that a vote is a prayer; claim that democracy is evil outworked politically and show how the Samoan Prime Minister epitomises foolishness with his recent legislation that legislates that his country is Founded Upon God and [shortly] will also force all his subjects to vote. 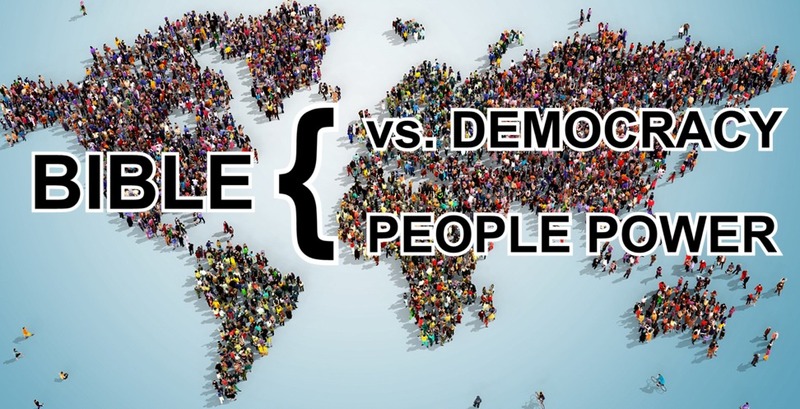 Following a recent book review of Ron McKenzie’s summary of the Government of God – a paradigm shift of thinking away from political power systems of the world back to the ways He set out in Scripture – I now drill down into the voting process showing how evil is outworked. Christianity’s fundamental premise is that mankind was created, not evolved, thus has accountability to the Creator, but has usurped all of that and that we can and will naturally “go our own way” which is now (post-Fall) generally contrary to His original instructions. We can see this from the history of man constantly thinking that he is the centre of the world, boasting and building empires, only to have them crumble around him as they are proven to be ego driven efforts destined to fail. Not even the mighty Roman Empire could survive itself with corruption to the core. The “Land of the Free” now isn’t, having led the world into the enslavement that debt based on human greed brings it – all based on the nasty fishhook of compounding interest. Central to the biblical message is that when we do things His way, blessing results; the alternative (our way of rebellion) is accursed. The nature of power is coercion by force. In the above-mentioned book, and on his website Ron explains that this force is totally contrary to the example that Jesus showed . . . the Spirit of God is not one to use force. He has the authority and CAN but WON’T. It is His nature (as Jesus showed us) to teach, preach, lead, love and motivate us to the point that we will choose to do the right thing. Political power gains its authority from force (Kings, Emperors & Dictators use their military to gain and maintain power) and in a democracy from mankind delegating his authority to it, by voting. Real Christians (by that I mean ones who have real faith) don’t vote. Jesus didn’t vote like we do because he wasn’t living in a democracy. His vote was emphatic though when he decided where his loyalty lay – NOT with the tempter. Instead, He trusted the Spirit of God to do what He wanted to do in the lives of the people He came to save. He knew and understood His Father’s ways, thus chose not to participate with the political system of His day – despite the temptation to do so in the wilderness. When we vote, we are effectively entrusting the power and authority that we have been entrusted with, to the people within the political system in which we choose participate. When that system is opposed to God’s purposes we are making a spiritual statement when we participate in it. Voting per se, is a matter of faith. A vote is like a prayer. Christians often pray about which candidate or party to vote for, but less about whether TO vote or not. While we may think that we are genuine Christians doing God’s will when we pray about which candidate to vote for the very fact that we vote in a system devised by man, used by evil at all, short-circuits faith in the Lord. Think of this example . . . You have $1,000.00 you want to be kept safe for a little bit. “Give it to me!” I say. “I’ll hold it for you!” You look at how money dissolves in my hands. You then say, “Oh Dennis I trust you” but then you deposit it in the bank. Some may say that this is wisdom, but that’s beside the point; you don’t trust me. Period. Likewise with Christians who vote. It’s like they are saying . . . “Oh we trust you Lord!” then they vote. They don’t trust Him. Period. The Western world has fallen into delusion over the rise of democracy. Democracy is the perfect system of government of man. Delusion requires deception. The deception is not accidental. It requires force to get democracy into a society and then to maintain it. Speak to the multitudes of returning war veterans and the millions who have lost those they love in war and you will hear the support for this statement. Democracy does not come cheaply yet the only price of doing it His way is humility. In general, most in the West, sadly including most Christians, consider the huge loss of life a price that must be paid for their god of democracy. As with all idols, we only worship this idol of democracy through deception, because nowhere in Scripture is democracy held up as anything other than contrary to God’s purposes. Democracy gets a huge ‘bum rap’ from the outset of the book of Genesis to the tail of Revelation. Adam and Eve conspired against God – they voted. The Israelites voted to bow down to the Golden Calf; to walk the desert for another forty years [well indirectly, at least! ]; to go their own way day after day after century after century. The people of Jesus’ day voted to dispose of His threat to their self-rule on a cross and the people of today support the very political process that the Lord shows us (Daniel & Revelation) will implode in due course – the will of the people. Democracy as a system is THE most easily abused system by evil. Simply convince 51% of people that you have their interests at heart, and BINGO, you’re in! This is the way of the Western world is it not? Politicians lie. We pay. TPTB gain. Deception is the starting point for the growth of democratic government. The first deception is that we have the right to determine our future, and our present for that matter. Oh, and we can also adjust our perception of the past a little too once we have control of the present and the future. This is the pride that affected our ancestors way back when, in the Garden. When we are deceived, we first deceive ourselves. The truth is [the Christian perspective] that the Creator has the rights, not us. When we submit to Him – He sets the rules, not us. Then having been deceived, we deceive others and if they don’t comply, we gather the troops [literal & figurative] and force them to comply with our goals. Who in their right mind would go out and stand up for the Lord and His ways in a society that hated Him; that worshiped democracy; that had lost their fathers and grandfathers who gave their lives for this system? This is the nature of humanity where we force others to abide by our chosen evil, or we remove them or destroy them so as to perpetuate our deception and our pet evil. The Western world is quite subtle about its political systems, presenting democracy as something good but nothing could demonstrate the foolishness of political leaders more aptly than the conduct of the Samoan political leader Tuila’epa, who thinks that his power has increased because God has put him in power; that he knows best because he has that power; that His country is uniquely Christian so he has ‘adjusted’ the Samoan Constitution to legislate that fact and he will now force all to vote. Spare me days, this is all BS! He cannot even answer the question whether his country is “Founded Upon” the Catholic or the Protestant God, let alone anything else half contentious! I lived in Samoa for seven years and know the people and culture very well. I also know the Samoan Prime Minister very well too, personally. “Subtle” in the Western sense is not one of his gifts. Samoans as a rule are a little more ‘uncultured’ in the Western ways (they have their own which is the unique Polynesian ways in Samoa called Fa’a Samoa) which putting it crudely is essentially crude political power [might is right] surrounded by a complex array of spoken niceties. Imagine a fist on your face, then a smile on your dial and you’ve pretty much got Fa’a Samoa. Samoa (and the Prime Minister is Samoan of course) is all about show. Connecting Samoan things with reality in a spiritual sense is pretty crude really – “our leaders embraced the Missionaries a hundred years ago; we all go to church now and so we’re a Christian nation!” pretty much sums it all up. They steal from you all week and then the priest steals from them on Saturday or Sunday (depending on whether you are SDA or LDS or CCC or EFKS or, or, or), and no I am not kidding. The spiritual foolishness of the political leader can be seen with recent changes to the Constitution (yes this is THE core document upon which Samoa’s independence in 1962 was/is based) that legislate that “by it’s Constitution [now] Samoa is a Christian nation!” OMG, not even the boys that wrote the Constitution dared to include THAT nonsense in it. This is why they deliberately left it out of the Constitution and only slipped it into the Constitution’s Preamble! But Tuila’epa, like many aging Catholics with a conscience, considered it too important an oversight, used his political power to gain the required endorsement to change his countries Constitution to enforce the impossible – a Christian country by law, no less. So the consequences of this stupidity are that [shortly] all his subjects MUST vote, again BY LAW. I know Tuila’epa very well and I can tell you that he actually thinks that legislating voting is a good thing. He actually thinks that democracy is a good thing. He actually thinks that because his people look to him to do their thinking that he should do their thinking for them! I can also predict with a high degree of probability that he’ll be thinking of his own legacy and hopefully a reward at the Pearly Gates. The man though, is a fool. He is simply a politician working with bureaucrats and other politicians with zero understanding of spiritual matters and the heart of God. As a politician he takes (now by force of law) the authority of his people, who must vote, and who increasingly do vote for him. They say to me (yes literally) that they all vote for the candidate that gives (or promises) them the most and they are proud of it. That’s democracy! For the record, I wrote the book Corruption in Samoa, for which Tuila’epa granted me “prohibited immigrant” status, oh and he did so against the law too which shows that, because he has the power to write the law, that he can justify the breaking of that law when it suits him. Political power is an anathema to genuine Christianity, except in Samoa of course [sarcasm!]. Christianity is not a religion it is a relationship. Christ kept His most violent words of condemnation for the religious leaders of the day. He never once spoke of a church, or churches; politics or political power positively. He spoke constantly though about a personal relationship with, a love of and from the Father and His followers DOING what He said. His approach to those around Him who hated God, was to let them do what they wanted but to build up through teaching, example and love. Then when the time was right, to hammer them with revelations of the truth – about their evil. Political power (currently a force mostly exercised in the Western world through violent democracy) is contrary to the heart, purpose and wishes of God. It has its power from the authority imparted to it by those deceived to worship it. Like all things by and for mankind in opposition to the Creator’s design, it will implode in due course. Voting within this system is a clear demonstration of lack of faith in the biblical God. Genuine believers who choose Christ as their Master are in cognitive dissonance if they promote, justify and participate in systems openly opposed to the Lord’s ways. I’m not. It’s a binary matter. My head is clear. I voted only once in my life, when MMP was first introduced in New Zealand, and I knew the candidate I voted for. I am now wiser and have repented of that error and sought His forgiveness for my lack of faith. I now trust Him to do exactly that which He wants in the world in and through me, inspite of, not because of the politicians of the day. I love watching the power games outworked in and through the players of the day who strut their stuff on Shakespeare’s stage and how those caught up in party politics get their cheap thrills and spills just the same as I love watching Hogan’s Heros, a good Western or James Bond classic, but my money is on something a little more real – God’s word in the bible. I’d also never vote, even if I had to, especially not in Samoa. Fortunately I currently don’t – have to, that is. Choose wisely people, when seeking to influence the world around you.